I’ve been continually impressed with the Andrew James range of kitchen items and this food slicer from them is no exception. I love how they manage to make really good quality products that often incorporate more premium features while still keeping it at a budget price. Not always the absolute cheapest, but definitely great value. 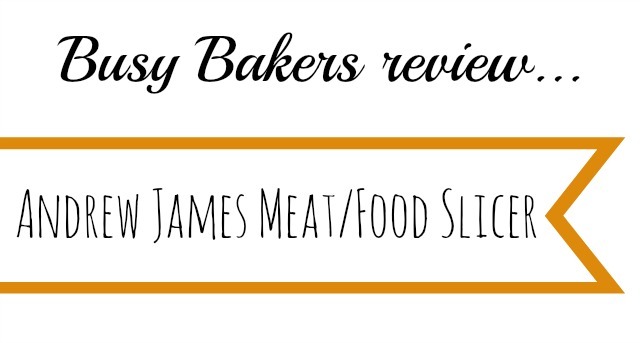 In this article you’ll find our Andrew James meat slicer review where we’ll take a look at all of the features of the product in more depth. As I just said, what you get with these products is value and it’s no different with the Andrew James Electric Precision Food Slicer. What matters most is whether it works though and this one is excellent at cutting through a variety of foods. It will cut any thickness from 1mm all the way up to 15mm. The food slicer is also available in a red and black colour as you can see in the pictures below. One unique feature about this slicer that isn’t often seen is that you get 3 separate blades included with the slicer. You’ll get a Universal Blade which is a great all rounder and can be used for cakes and vegetables as well as bread and meat. You’ll also get a dedicated bread blade which will work even if your loaf is fresh from the oven or bread maker. Finally you get a meat and cheese blade which is excellent for cured meats as well as the Sunday roast. While having other blades may seem like more than you’ll need, especially if you just want to cut bread for example, it’s always worth having some spares anyway as they can be expensive so having these included is great value. The Andrew James food slicer has a number of safety features. There is a large on/off button which means that it will not be put on by accident. You don’t need to hold down the button to keep it on which some will find much easier to use. 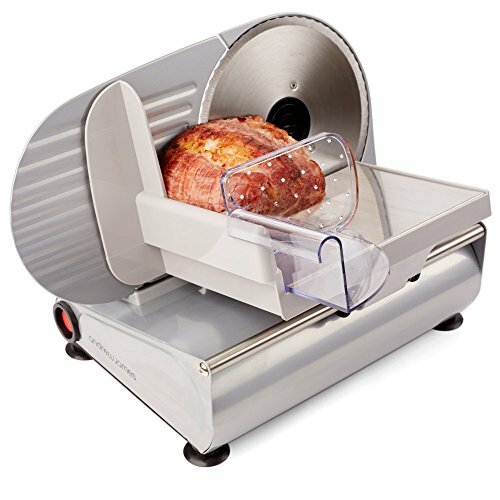 There’s also an end piece holder with blade guard which is for using to hold your meat or bread. Basically it stops you fingers getting close to the blade when you’re nearly finished slicing and only have a small amount left to cut. Finally there are non slip feet which are essential to make sure that the slicer does not move around potentially causing an injury. As you know, as well as giving my own thoughts I like to scour the internet to get a good overview of what people have said about this product. It’s a very popular product on Amazon with well over 800 reviews, the majority of them being 5 stars. It’s overall rating at the time of writing was 4.4 out of 5 stars. The overwhelming positive about it is the value for money – it works well and isn’t too expensive. Some people find the machine a little hard to clean – these slicers can often be fiddly. Other negatives are that it seems a little cheap and not good quality. For the money you get a lot of machine here and it does the job well. I always think about how much I save by having a food slicer, from making nice even slices of bread to thinly slicing meat so it goes further – always worth it in my opinion. You can see my food slicer buying guide here if you’d like to see my thoughts on this and other slicers.